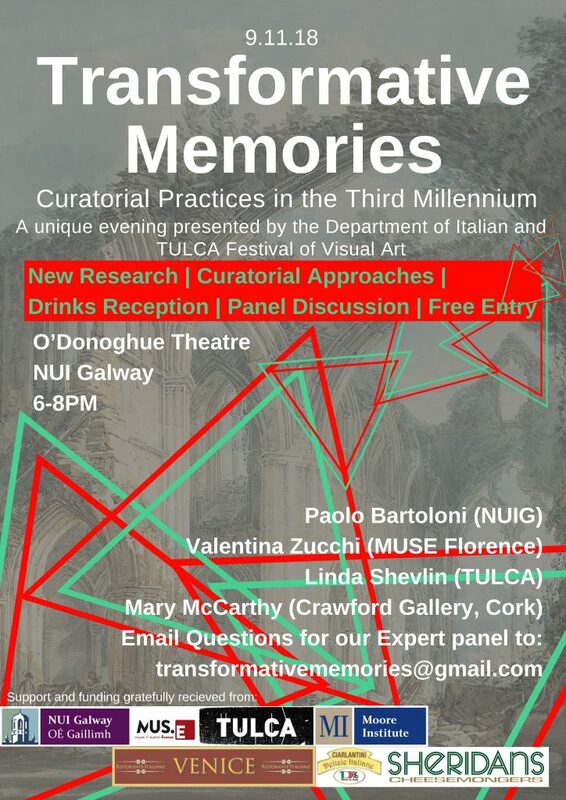 Friday November 9, 6-8pm – O’Donoghue Theatre, National University of Ireland Galway – Transformative Memories: Curatorial Practices in the Third Millennium. A Roundtable event with: Valentina Zucchi (Mus.e Florence), Linda Shevlin (Curator, Tulca Festival of Visual Art, Galway), Mary McCarthy (Crawford Gallery, Cork), Paolo Bartoloni (Italian, NUIG). 9 Novembre 2018, h. 18.00-20.00 – O’Donoghue Theatre, National University of Ireland Galway – Transformative Memories: Curatorial Practices in the Third Millennium. Tavola rotunda con: Valentina Zucchi (Mus.e Firenze), Linda Shevlin (Tulca Festival of Visual Art, Galway), Mary McCarthy (Crawford Gallery, Cork), Paolo Bartoloni (Italian, NUIG).